This community run eco lodge is located in the small community of Bella Vista near Samaipata and lies in the beautiful region known as the Elbow of the Andes. This is the point where the Andean Mountain range dramatically changes its south-easterly direction and turns to the south, making for some spectacular mountain scenery. The lodge features three comfortable rooms with the capacity for up to 10 guests, two bathrooms (with hot water), a kitchen, dining room and living room. It also has three fully-equipped camping areas. 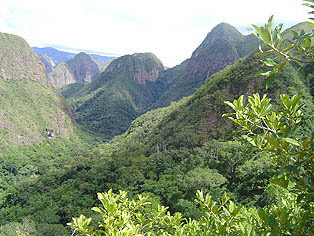 Amboro National Park is at the transition point between the Andes, the Yungas, the Chaco, The Amazon and the plains of Santa Cruz. There are a series of well maintained trails where you can go on hikes of 3, 4 or 7 hours duration. You can also undertake guided 1 or 2 day hikes that take you through diverse landscapes:- from lush jungle with its beautiful flora and fauna to an area featuring an unusual species of cactus called "monkey tails, rare orchids, bromeliads and tree ferns. 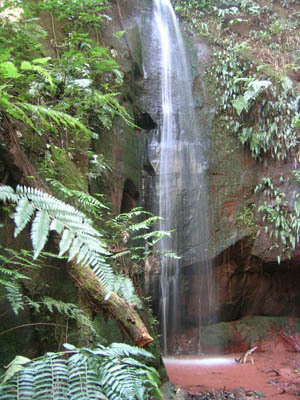 It is also an ideal place to observe many species of birds, butterflies and several species of mammals. Full board (breakfast, lunch and dinner) is offered, local guides trained in the interpretation of nature and first aid, hiking trails, guided 1 or 2 day hikes, horse riding, mountain bike riding, sport fishing, bird watching, night walks for observatation of nocturnal life.